From Peter Salerno’s Kitchen: Bellagio FIXation Cocktail Recipe – Design Your Lifestyle. January 2015 Peter Salerno, Inc.
Las Vegas cocktail recipe for FIX at Bellagio’s signature drink, FIXation. With KBIS 2015 right around the corner, Peter Salerno and the staff of Peter Salerno Inc. are preparing for their annual trip to the massive Las Vegas kitchen and bath design convention. And what better way to celebrate a trip to Las Vegas than with a cocktail recipe for one of the most famous drinks on the Las Vegas Strip? 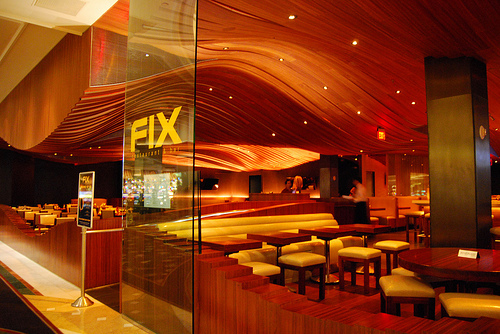 FIX is a premier dining establishment inside the Bellagio, led by corporate executive chef Brian Thomas Massie. Being a highly-prized dining destination in Las Vegas, it goes without saying that FIX has its very own signature drink – the FIXation. The FIXation was created by mixologist Michael Monrreal, and combines the alluring tastes of white peach, lemon, simple syrup and sparkling wine. A FIXation will run you $20 at the FIX in Bellagio, but you can make it yourself at home with this signature Las Vegas cocktail recipe! The staff at FIX was good enough to share the secret recipe for the FIXation cocktail with USA Today, and we’re passing it along to you here. Whether it’s while you’re waiting for your flight to KBIS 2015, when you arrive at the hotel, or sitting down to a meal at Bellagio’s FIX, you need to try our favorite signature Las Vegas cocktail for 2015. Shake the CÎROC Peach, white peach purée, fresh lemon juice and simple syrup together. Add in the sparkling wine and strain into a champagne glass. Garnish with a lemon twist.